There was a great horror booth at comic con that had a guy that appeared in an episode of X-files. There was also Max Brooks, Bruce Campbell, Michael Rooker, Chandler Riggs and a whole slew of Zombie related guests. 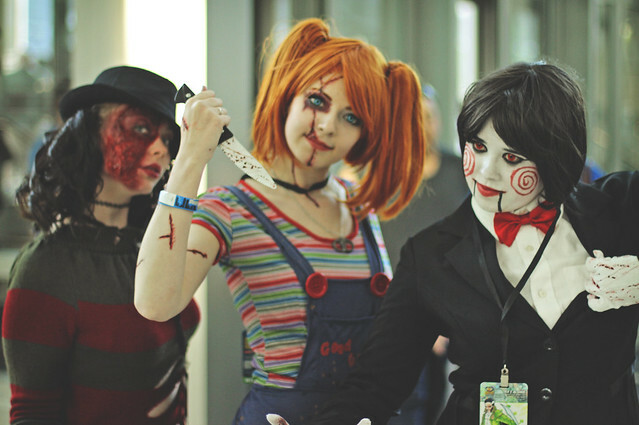 Perhaps, more awesome than that was the horror based COSPLAY. The big Triangle head dude from Resident Evil walked by me a few times. There was also a massive presence of Umbrella Corporation swat teams. Which should have made me feel better but those guys tend to die faster than Red Shirts. Ok So not a COSPLAY but the statues at the WETA booth were both amazing and intimidating! Also I saw Star Trek Red Shirt Zombies and that is a terrifying thought. If all of the dead red shirts become zombies the world is DOOMED!